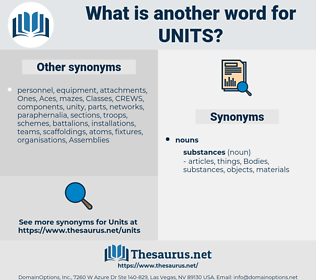 What is another word for units? 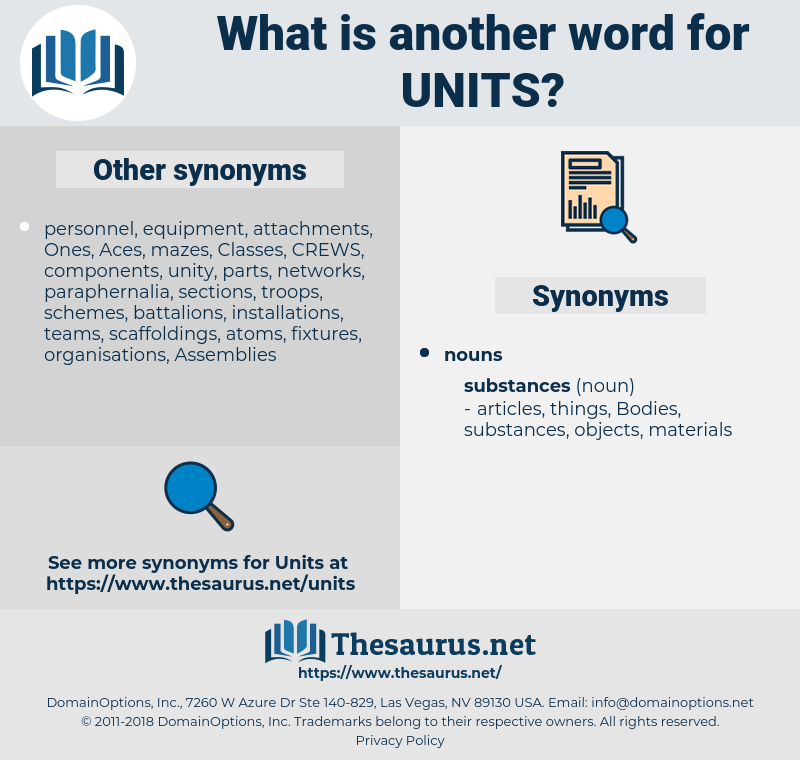 Unities, sub-units, subunits, battalions, munitions, combinations, installations, platoons, Apparatuses, Households, Companies, subdivisions, commands, committees, clinics, generators, apartments, squadrons, suites, machineries, Soldiers, housings, buildings, police, shareholders, trucks, products, Bureaus, projectors, tenants, railcars, meters, baskets, wards, desks, Boxes, unity, packets, players, Feet, heads, establishments, reactors, utilities, lodgings, ensembles, Houses, Schools, brackets, Ones. bundles, audiences, products, establishments, LINEs, groupes. UNPROFOR, UNIS, UNFICYP, counterpart, counterparts, capability, Capabilities, Consulting, substantive, UNDOF, national, jurisdictions, groupes, settings, point, points, centros, addressable, carrier, developments, ministerial, devices, ensembles, regional, features, restraint, ERU, capacity, Capacities, region, FIUS, services-based, kingdom, Schools, pieces, provision, delivery, brackets, ERUS, home, homes, SFOR, ISAF, ship, focus, secret, ability, core, CERS, RCUS, disk, cellular, canal, Them, craft, SQ, KFOR, SQS, skills, unitary, focal, des, iv, access, Les, able, have. instructions, headquarters, Undertakings, air-conditioners, Opportunities, collectivities, uniforms, functions, sub-divisions, outbuildings, corporations, volunteers, Associations, equipments, conditions, regiments, Stations, Duties, requirements, configurations, neighbourhoods, inspectorates, infrastructures, individuals, sub-sections, contributors, collections, fittings, Occupations, denominations, reservations, transactions, increments, contributions, brigades, reorganizations, elements, Industries, proportions, administrations, solutions, commissions, collective, enterprises, appropriations, conditioners, conglomerates, deployments, aforementioned, constituents, Contingencies, treatments, Neighborhoods, locations, Trainings, acquisition, Laboratories, militarys, issues, exhibits, portions, additions, Helicopters, factors, formations, kits, Dispensaries, joints, shareholdings, times, Businesses, considerations, delegations, thousand, pre-packages, participations, Quantities, sessions, computers, militias, specimens, radioisotopes, Standards, digits, sub-groups, amenities, proceedings, allocations, mechanisms, mission, Missions, calculated, occasions, Nationalities, things, engines, positions, prepackages, Batteries, amounts, Infirmaries, obstetrics, ingredients, locomotives, flexfields, interests, directions, residents, Dormitories, matters, glazings, Automobiles, Counties, instalments, patrols, cooperation, Prisons, fitments, outposts, crewmembers, arrangements, Investments, containers, patterns, strengths, Thermometers, recordings, backgrounds, Hospitals, instances, Guns, trains, reserves, sites, pavilions, Difficulties, consignments, promotion, Carriers, values, transition, supports, assessment, Vehicles, Nuclei, districts, tranches, fixtures, Identities, cohesion, secondments, Categories, Respondents, documents, foreigners, packings, dispensers, torque, neurones, Packagings, Families, providers, accounts, channels, headings, practices, tiers, stakeholders, armies, combatants, bundles, grassroots, Programs, servings, antennas, Equities, submissions, bearings, notebooks, factions, Governments, suspected, Movements, details, Firms, grounds, tasks, Factories, listen, peacekeepers, holdings, advancement, regions, statutes, cartridges, Boundaries, sub-teams, airframes, terms, Operators, platforms, partners, investors, suspects, monitors, outlets, projects, items, cigarettes, Artifacts, tons, tutorials, allowances, numbers, subgroups, materials, transfers, Activities, audiences, fields, colleagues, cohorts, pairs, references, means, complexes, processors, series, offerings, receivers, Securities, Clients, Airbags, centrals, drivers, barracks, buckets, Resources, data, articles, assets, stands, Neurons, Capsules, licensees, shelters, tents, Coins, flights, courts, venues, january, colleges, missiles, batches, circles, Animals, headlamps, others, gangs, organisms, stakes, credits, hostels, plaques, stores, CAMPS, stops, tips, zones, Artefacts, customers, ways, landmines, chambers, Escalators, employees, TONNES, Elevators, Patches, sub-offices, scrapbooks, types, datasets, wings, kinds, Workplaces, ranks, phones, bins, principals, piles, courses, Forums, annexes, agents, months, planes, tools, Lights, volumes, supplies, vents, lifts, basic, models, contacts, domains, vessels, spheres, acts, butts, classrooms, links, exchanges, sidewalks, quotas, Addresses, auditors, explosives, Villas, pouches, jobs, subjects, Cities, aspects, mobile, rounds, sources, aids, aerial, aerials, dishes, leaders, blockades, hubs, lessons, frameworks, Phases, Towers, nets, schemes, LABS, ranges, estates, buses, Cameras, plates, relief, streams, DISCS, divides, presences, officials, sales, Ships, seats, plugs, ridings, programmes, challenges, NODES, figures, wagons, radios, aliens, weapons, boulders, tables, Classes, shifts, cores, slices, mills, facts, Aerosols, Rames, frames, disks, parcels, cards, levels, MINES, samples, lots, stages, rockets, words, periods, causes, shops, files, Saturdays, owners, degrees, Dives, sizes, gears, laws, corpses, actors, OARS, RIGS, herds, orders, pools, objects, only, posts, cars, Persons, modern, users, Properties, men, albums, panes, plots, GPS, packs, PORTS, Condoms, Toys, sides, plans, powers, doses, MALLS, spaces, Floors, marks, Boats, arrays, meetings, bags, shells, people, blades, slabs, Records, blocs, berths, farms, LIDS, SPARES, Copies, D, swaps, Cannons, grades, receptors, caps, PODS, doors, \, flags, feelers, PCS, covers, arms, -rrb-, fires, Forms, lamps, Drugs, places, look, HOS, peers, books, reaches, P, Males, states, counterparts, poles, implements, Capabilities, lands, calls, Plays, LINEs, jurisdictions, Entries, groupes, settings, habitations, leads, points, developments, goods, devices, features, Capacities, pieces, homes, core, CERS, SQS, skills. unity, establishment, establishments, implements, reactor, reactors, habitations, residences, lodgings, hardware, division, divisions, dependency, Dependencies. personnel, officers, residences, divisions, Dependencies. If the units change the total must do so also. To pass on acquired knowledge, they had to have family units in which teaching was done to the young - at least at the beginning.